factors of strengths, weaknesses, opportunities, and threats of Bali Nyuh Gading (BNG) Villa, North Kuta, Bali, in order to design its appropriate marketing strategy.Respondents in this study are the general manager, director of sales, and finance manager of the villa, because all of these three are the decision maker in the villa. The technique of data analysis used is SWOT analysis and mapped in SWOT diagram.The study shows that the indicator of internal factors which become the strength of BNG Villa for the coming year (2015) is in the indicator of product offered, price, distribution channel, service, physical environment, management process, human resource, organizational structure, net income, and cash flow.The weaknesses is in the promotion indicators. villa.Threats to be faced are local culture and competition between villas.Alternative strategy which should be done is an aggressive strategy with a growth oriented strategy. KRISNA DWIPAYANA, Made Adi. STRATEGI PEMASARAN BALI NYUH GADING VILLA DI KEROBOKAN KABUPATEN BADUNG. 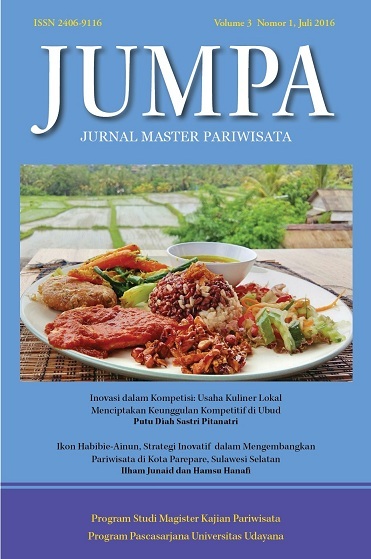 Jurnal Master Pariwisata (JUMPA), [S.l. ], aug. 2016. ISSN 2502-8022. Available at: <https://ojs.unud.ac.id/index.php/jumpa/article/view/23049>. Date accessed: 21 apr. 2019. doi: https://doi.org/10.24843/JUMPA.2016.v03.i01.p10.